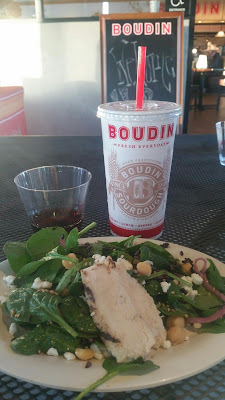 Earlier this week I was able to taste the new Spring Salads at +Boudin Bakery in Huntington Beach. To say they are delish is a total understatement. They are all full of significant ingredients that, the ever so awesome, Chef Alan Skversky has specifically developed for each one. The dedication and pride that goes into the Chef's creations is an art of it's own but to see him describe and serve you that tasty bright dish is an honor. He truly loves food and fresh food at that. I love that too! What I think is very different and always a win... Boudin has Happy Hour every day after 4:30pm! The pairings they offer from the Kendall Jackson and La Crema bring out the bold tastes of each salad. 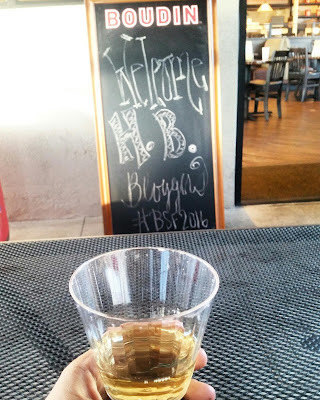 Need help deciding what wine to pair any item with, just ask, they will help! 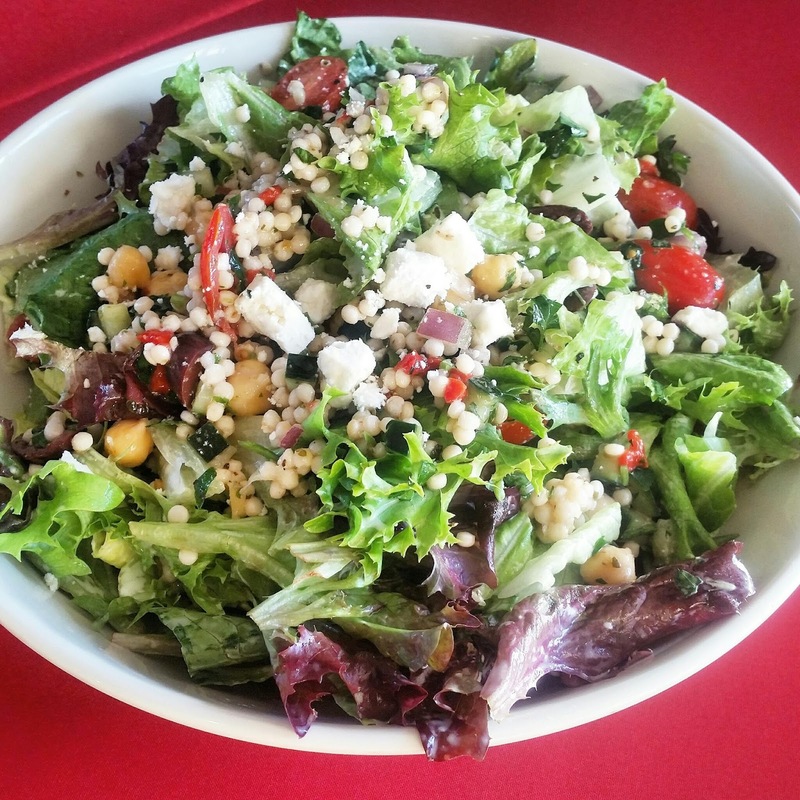 All of the New Spring Salads are made fresh in house down to the dressing. Each Salad is carefully crafted so that even each grape is sliced in half, that's the way Chef Alan says it's best! So in case your mouth is not watering yet, let me give you the insider look at all of the salads that will be available, March 23rd! The Mango Quinoa Salad - Vegetarian and Contains Nuts. 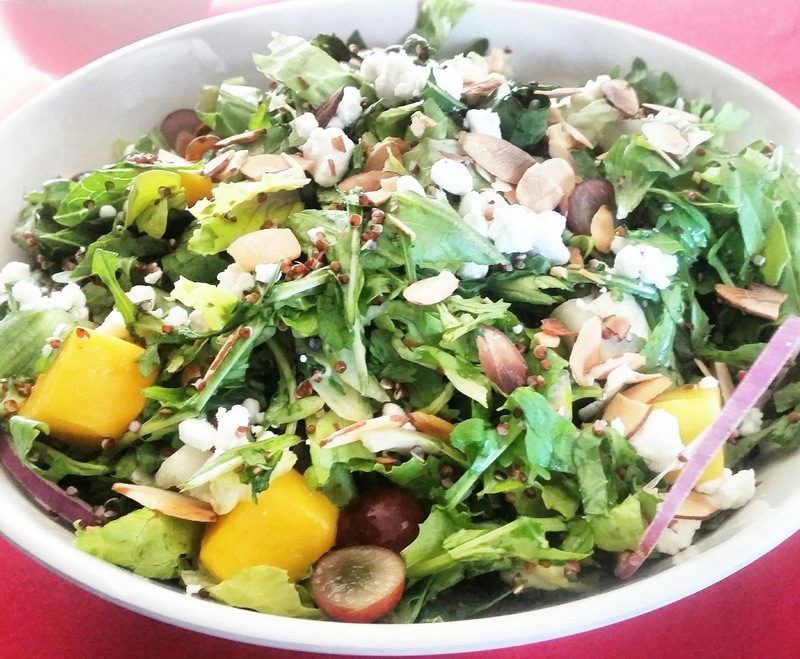 At 287 calories this goodness is made up of romaine lettuce, arugula, red quinoa, mango, red grapes, red onion, almonds, goat cheese and a house made mango citrus vinaigrette. It really does bring so many flavors together and the mango is the most perfect tart sweet bang to tie it all together. The Lemony Couscous. A favorite from last year that the Chef said everyone wanted to have returned to the season menu. This was my favorite. Totally Greek-ish hehe! Spring mix, Israeli Couscous, feta cheese, garbanzo beans, cucumber, grape tomatoes, Kalamata olives, roasted red pepper, red onion, parsley, creamy lemon dressing and only 427 calories. The Forbidden Rice and Chicken Sesame - Contains Sesame Oil. I was surprisingly satisfied with the blend of the black rice and apples. That earthy boldness of the rice with the mix of fresh apples is just delightful. 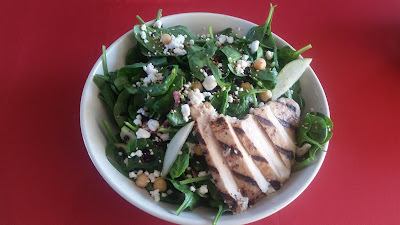 Baby Spinach, black rice, all natural chicken, Granny Smith apples, garbanzo beans, pickled red onion, goat cheese, house made sesame dressing and only 416 calories. Yum! The Bacon, Blue and Beets Salad - Contains Nuts. I am not sure what happened with my photo. It is not on my phone and this was the first salad I tried and took a photo of! But I will add in an image shortly. The Salad itself did not last long on my plate! I am not the biggest fan of Blue cheese but this was delish. You can also ask for anything on the side too! Made up of a Spring mix, all natural chicken, red onion, roasted golden and red beets, green beans, applewood smoked bacon, blue cheese, spiced walnuts and ranch dressing, this salad is at 460 calories. 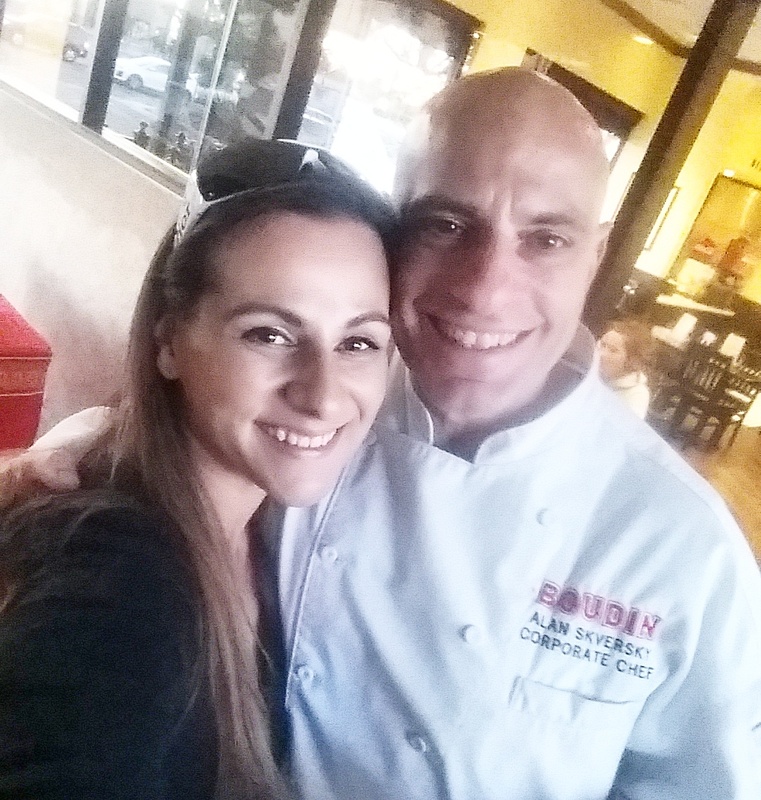 I had so much fun tasting all the new Spring Salads at Boudin, I am looking forward to returning very soon, I need another Lemony Couscous Salad stat!! Check out the location nearest you HERE! Visit Boudin on line HERE! Sign up for the Loyalty Club HERE! You can earn $3 off your purchase for every $50 you spend and get a free 1lb. loaf of sourdough bread every month for a year. Email Club Sign up HERE so that you can receive exclusive offers and information on what't new at Boudin. Let me know what you think when you get a chance to try the Spring Salads at Boudin starting March 23rd!